There is a saying that one should buy “blood in the streets”. But that doesn’t mean one cannot buy too early. We are seeing popular protests in places like Turkey and Brazil, and that has driven down the stocks in most emerging markets. Time to buy? While the Dow Jones Industrials is down about 5% from its recent peak, the emerging markets have lost over 20% since their peak in early January. 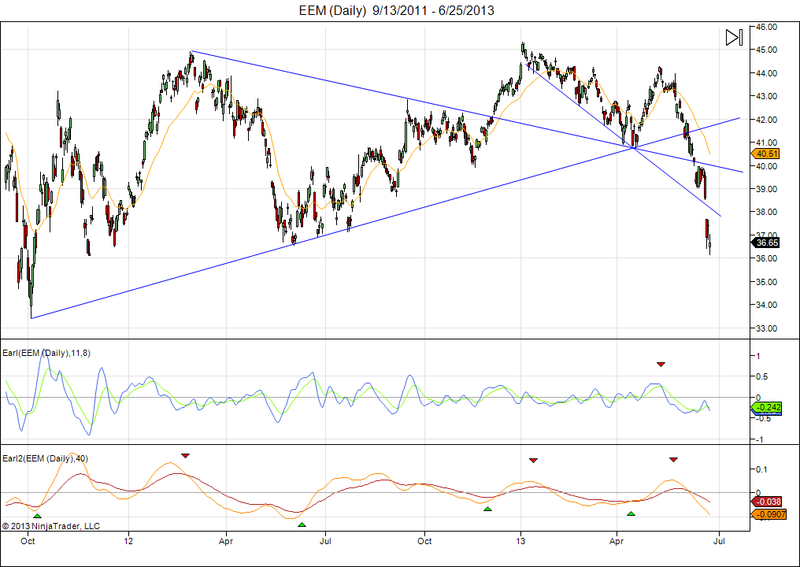 Notice how EEM has dropped below several trend lines and is now trying to hold on to support around $36. The Earl2 is getting quite low, but not showing any signs of turning up yet. This means the eventual bottom could still be a few months away. If the $36 level doesn’t hold, then look for a revisit of the October 2011 lows at ~$34. So, I would be patient if you plan to buy EEM. A quick look at some markets that are currently in the news. This market is correcting from the huge bull market it had last year. Here the Earl2 (orange line) is showing first signs of stabilizing, which means that the worst could be over for Turkey. There is a major support level at ~$55, so one could start some careful buying with a stop-loss just under $53. If this support gets broken, then look for $45 and next $40. Has been weak for several years already, and may now be in the final selling climax before printing a major bottom. Here the Earl2 is also falling into the region that typically marks important lows, but we see no signs of stabilization yet, so also for Brazil I would wait. Investing is a game of patience, and there is no need to try to catch falling knives. In the charts I have marked the recent buying opportunities with green arrows, and as you can see, when the Earl2 turns upwards from a bottom there is usually still enough time to get on board at low prices. Most of these charts are likely to show more attractive setups one or two months from now. Emerging Markets Present Opportunity For Those Who Do Their Homework. This entry was posted on June 25, 2013 at 9:35 am	and is filed under Market Commentary. 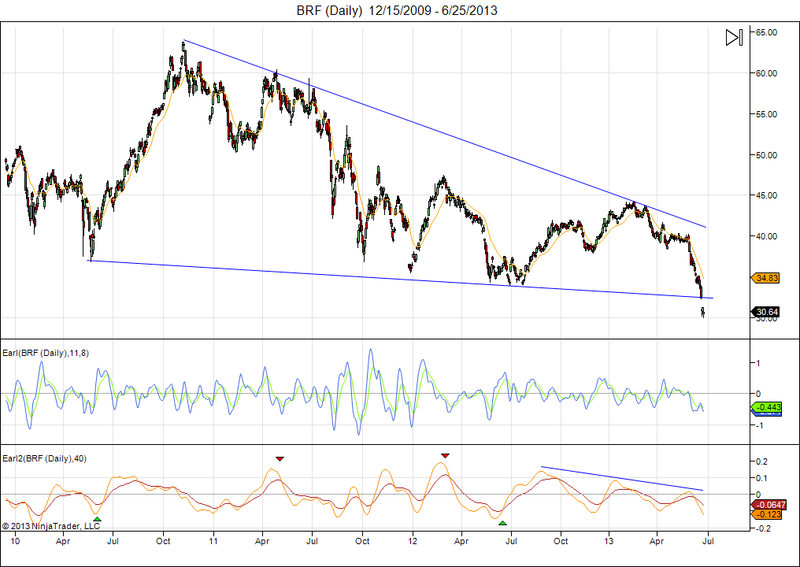 Tagged: Brazil, BRF, EEM, Emerging markets, TUR, Turkey. You can follow any responses to this entry through the RSS 2.0 feed. You can leave a response, or trackback from your own site. what about big markets china and india ? any chart .?.. Most emerging markets have very similar chart setups for the moment. 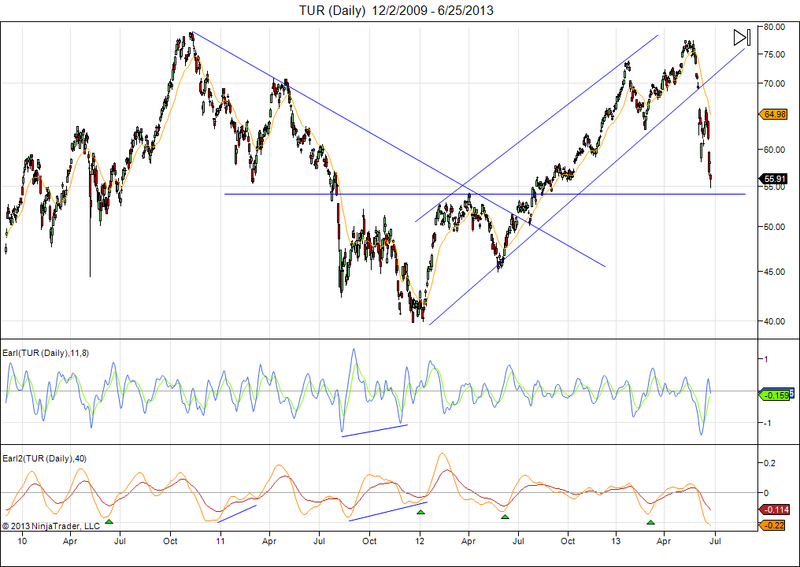 Indicators have fallen in oversold territory, but are not yet turning upwards. If buy signals appear I will post about it.